The aim of this mechanical engineering project is to fabricate a manual can crushing machine. I am sure you people have used or atleast saw cans of pepsi, coke and other cool drinks. These cans are made in Aluminium. And like any material, accumulation of used aluminium cans cause environmental problems. Above all recycling aluminium saves 95% of the costs for producing new ones. So these used aluminium cans should be recycled. Usually these cans are crushed before taking them to the recycling plant. This mechanical project is to fabricate a simple can crusher which can be operated manually by a single person. Given below is a video I found from youtube on Manual Can Crusher. It is called a multi-can crusher as cans can be fed continuously into the machine. The operation of this machine is very simple. A rotating assembly similar to that in an engine cylinder. Its working is similar to that in an engine cylinder. The flywheel is rotated manually. Connected to the flywheel shaft is a rotary reciprocating mechanism which moves the ram to and fro in the can holder. This to and fro motion of the ram crushes the aluminium can in the can holder. The can holder should have enough space to accommodate a single can. Usually its diameter is around 65mm but better check it with a can before you start building it. 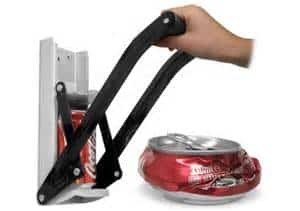 You can also make this Manual Can Crusher a double acting unit by introducing a can holder to the other side of the ram, so that for each forward motion a can is crushed and so is for every backward motion of the ram. sir pls give me full details of project . I’m interested in doing it. sir i want design calculation of every part of this can crusher machine……….. Please sir reply its urgent ……….!!!!!! sir pls send me all details regarding this project. Dear sir i am an final year mechanical engineering student i need the full details and pictures of the project can u please send it to my mail sir. thanks for u r information….. i want more ideas of thiss project………………… #Mech RocKers…………. sir i want design calculation of every part of this can crusher machine… so reply urgent sir. sir i want design calculation of every part of this can crusher machine. so reply urgent sir. plz give me full info about it. sir, kindly send me the full details about this. Sir plz give full info abt project n specification of machine …..